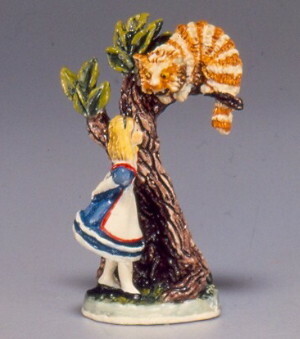 HISTORY: This is the third and final figurine in the Alice in Wonderland series. Production was limited to 5000. "The Cheshire Cat" was carved from a photograph. It is one thing to draw this breed of cat and quite another to carve one in three dimension. GENERAL: Little Alice has been playing a competitive game of croquet with the Queen and some of her subjects. During a break in the action, Alice looks up and sees a large, grinning, Cheshire Cat. "How are you getting on? inquires the cat. 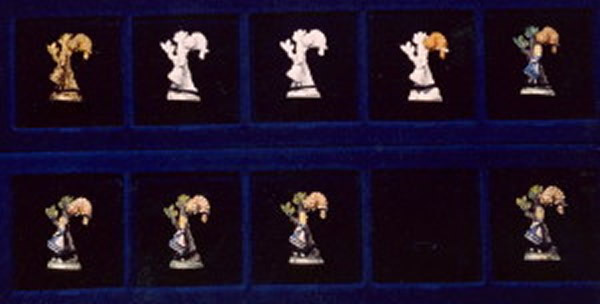 The figurine shows this moment from the story. Bob could not picture how he was doing to put a cat in a tree, working from the storybook words alone. "Down the Rabbit Hole" and "Cherry Pickers" had helped him carve trees with small leaves, but now he wanted larger leaves to add to the fantasy. Also, how could he take a large cat and put him high up in a large shaped tree and make the whole thing look balanced? He made the tree bend to the opposite direction to counter-balance the cat. The other problem was that Alice is facing the cat. He could not have them to close together, which would invade each other's territorial imperative and also handicap the painters. When the cat saw Alice, he grinned. She observed a great many teeth and his long claws, so she treated him with respect, even though he seemed good natured. How to depict the caution of Alice was another challenge, so he put her arms behind her and had her peer around the tree. That also removed the problem of painting that pesky bow on her dress. He also placed her feet farther apart to make painting her shoes easier. Notice the deep texture of the tree as compared to the tree in "The Rabbit Hole." Don't miss the grin on the face of the cat. This figurine has glazes, texture, and smoothness of the leaves. Bob decided to stop the series here, since he felt he had explored the story sufficiently. SIGNED: In the back at the base of the tree. A "Process Stick" was made to depict the production process. Below is an image of the steps involved in creating The Cheshire Cat.